A single game...in the M&M Guernsey! 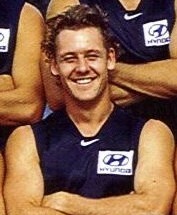 Balkwill, a 192cm blond haired mobile tall, played just a solitary game for the Blues in Round 3, 1997 against Adelaide but would have the unique distinction of being the only player in Carlton history to have played senior football without donning the famed Old Dark Navy Blue. For this game was the one where Carlton wore light blue as part of a Sponsorship Deal with M&M! He remained on Carlton's list for 2 years: 1997-98 but other than the one senior game would spend all that time in the reserves. Balkwill headed back to SANFL club Central Districts for the 1999 and 2000 seasons. he retired at the end of 2000 due to injury problems. Andrew is one of those horribly unlucky yet also amazingly lucky players to play a solitary game for Carlton. Contributors to this page: molsey , Bombasheldon , tmd1 , Jarusa , BlueWorld , true_blue24 , kkk , keogh , Juzz and admin . Page last modified on Monday 06 of January, 2014 21:55:42 AEDT by molsey. 2002 - Brett Ratten Interview (pg 1 of 2) 5/6/02.